TP-Link  manufactures routers in various performance classes. The TL-MR3020 (Figure 1) is marketed by the manufacturer as a mobile router because it is small and light. However, it does not support 3G (see the "Hardware" box), although you can upgrade via the USB port. Thus, the router is aimed at people who do not need 3G or have a UMTS stick and therefore do not want to invest in an expensive mobile UMTS router. However, the "normal" use of the router is not the focus of this article; instead, I will describe how to convert it into a mini-server. The TL-MR3020 is a small, white plastic box (Figure 1) measuring 7.4 x 6.7 x 2.2 centimeters and weighing only 60 grams. A mini-USB connector is used for the power supply, and the AC adapter provided supplies 1 watt. Moreover, the router will also work without any problems on a USB port. Additionally, the TL-MR3020 includes a USB 2.0 port and an RJ45 Ethernet port (100Mbps). TP-Link provides a short, flat patch cable for the latter. On the wireless side, the small router supports IEEE 802.11b/g/n at up to 150Mbps. The TL-MR3020 uses five LEDs to indicate its status, four of which can be programmed. There is also a button for the wireless setup via WPS and a slide switch with three positions (3G/WISP/AP). Inside, the router has a 400MHz ARM CPU and 32MB RAM. The operating system resides on a 4MB flash chip. The USB port is used with the original firmware to connect a UMTS stick for operation as a mobile 3G router. Without a stick, the device acts as a wireless access point. As a useful addition to the TL-MR3020, I would recommend a mini-USB hub by Pearl (Figure 1). This device integrates a micro-SDHC reader and thus provides the advanced root filesystem described in this article on a memory card without blocking the USB port. 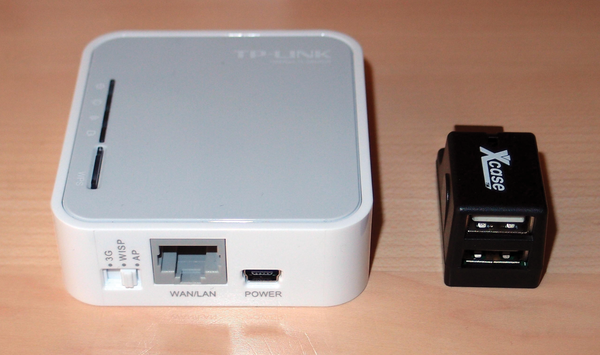 The router board contains additional ports, but TP-Link does not route them out. If you can use a soldering iron, you could attach other components, such as a serial console, an I2C interface, or an external antenna. The OpenWrt wiki shows some pictures and links to relevant instructions on its TL-MR3020 pages . To do this, you'll replace the existing firmware with OpenWrt , a special Linux distribution for microdevices. OpenWrt has a package management system that is in no way inferior to that of classical distributions; thus, only the limitations of the hardware can curb your creativity. The TL-MR3020 is well-suited to this purpose for two reasons: On one hand, it costs EUR 30 (US$ 40) – which is not too much, if you happen to "brick" the device. On the other hand, the manufacturer does not put any obstacles in the way of installing third-party firmware. To begin, download the correct version of OpenWrt  and follow the brief, but perfectly sufficient, instructions that come with the router to connect to the device's web interface. When you get there, upload the new firmware to the TL-MR3020 by selecting Upgrade in the new web form (Figure 2). Uploading the firmware is the only really critical step in the whole process. A defective firmware image will send the router off to the happy hunting grounds – your only chance is a soldering iron. Thus, before loading the image, it is essential to check out the postings on the OpenWrt wiki  and follow the appropriate instructions. At this point, you should set a password for root. OpenWrt then switches off the Telnet server for safety reasons and starts the SSH server. Next, adjust the network configuration so that the router is on your home network; then, you can move on and add more software. For details of the OpenWrt configuration system, see the "Configuring OpenWrt" box. The OpenWrt configuration system remains very consistent across all system-related packages. All configuration files are located in /etc/config and are simply structured plaintext files that are most easily changed in an editor. reads the value of the handler option in the slider section of the /etc/config/system file. For scripts, the /lib/functions.sh library offers a few utilities that significantly facilitate the handling of settings. To use the router as a server on your home network, the network configuration should look like Listing 1 (/etc/config/network) and Listing 2 (/etc/config/wireless). Lines 9-15 in Listing 1 configure the WLAN interface. In Listing 2, line 19 ensures that the server is integrated into the network as a WLAN client rather than as an access point or router. If you are looking for a particular package, the list subcommand outputs a package list with brief descriptions. For the USB installation, you primarily need a set of kernel packages (Listing 3). It's best to partition and format the USB stick (/dev/sdb in the listing – you might need to adjust this) on your PC. Besides the root partition, you'll want a home partition and, above all, swap space. Then, you can simply plug the stick into the router and change the configuration of the mountpoints in the /etc/config/fstab file. Lines 10-16 in Listing 4 are important. The last line of Listing 3 copies the entire root filesystem to the stick. Creating a backup now is advisable. The system will still boot, even without the stick inserted: In this case, it simply ignores the nonexisting devices.